Kitchen Pharmacy: Contains the alkaloid capsaicin which is an anti-inflammatory, can be used to topically treat osteoarthritis pain, and helps clear mucus from your nose and lungs. Chili peppers are supposed to be a great source of vitamin C and vitamin A. The only problem with that claim is the serving size assumed is 1 oz or 28 grams. At that level of heat you will probably need help! An interesting tidbit is the heat you feel after eating chili peppers is produced by burning calories and therefore, it can aid in weight loss. (But this is not our recommended way for you to lose weight!) "Capsaicin is being studied as an effective treatment for sensory nerve fiber disorders, including pain associated with arthritis, psoriasis, and diabetic neuropathy". The ideal serving size however is only about 2 grams so the readings above are a little meaningless. You dont need to worry about calories, carbs, fat and protein. 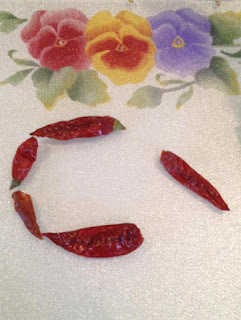 (about 2 medium sized red chillies no more than 3" long). Note that chillies vary significantly in their "scovil rating" or spiciness so choose carefully and once you hit your favorite variety say with it.